This charming and totally renovated (see updated pictures below) Chatham home is on a private road in a downtown neighborhood of exclusive homes. 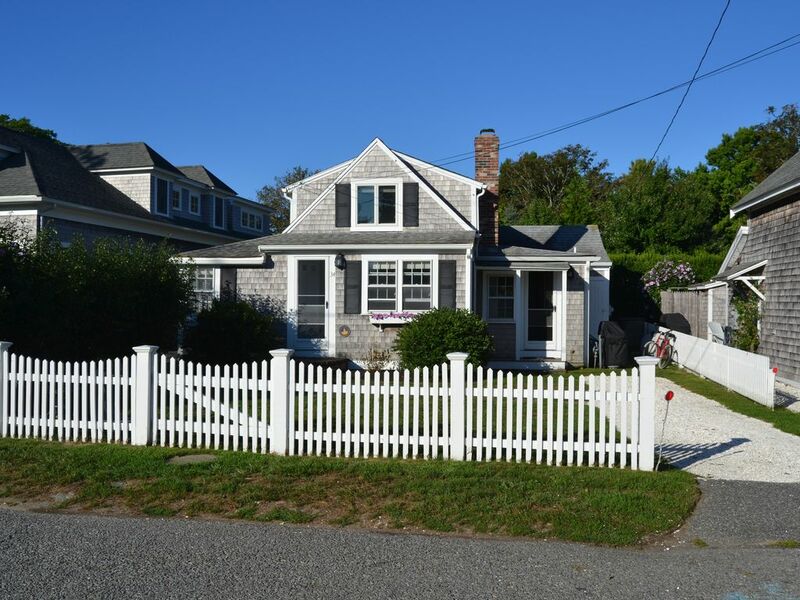 Its ideal location enables you to walk to Lighthouse Beach about (1/2 mile) and 1 block from downtown Chatham. Also, Oyster Pond Beach is a convenient 2 minute walk for a day at the beach. The two-story home is comprised of a living room, kitchen with breakfast bar, two bedrooms, sleeping porch with a daybed and a bath plus an outdoor shower. Just around the corner is a large park for all kinds of outdoor activities. Enjoy the many activities that Chatham has to offer: upscale shops and restaurants, Friday night band concerts, fresh fish from the Chatham fish pier, and the popular Cape Cod Baseball League games. Downtown shopping is spectacular!! Bathroom has shower, sink and toilet plus there is an outside shower. Awesome location! Easy with kids! We will be back! Loved our stay here. Cute town great place to walk around and explore. Several great restaurants, nice shops. Central location for exploring the Cape. Perfect for our girls’ trip! Clean, cozy, and centrally located! Perfect for our girls’ trip! The home was clean, cozy and centrally located to Main Street in Chatham. Tom was really quick to respond and provided everything we needed for the perfect trip. Highly recommend! We spent a wonderful weekend in this home during our first visit to Chatham and Cape Cod. The title of the posting says it all: quaint and cozy. The home was immaculately clean and tastefully decorated. We immediately felt at home and only wished we could stay longer. The house is also perfectly situated for exploring the town. We walked everywhere. I recommend this house without reservation. Our 2 week stay was perfect. Love the location and the house fit us perfectly. Outdoor shower & grill added to the enjoyment. Sticking out like a sore elbow (and out of the way of much of the Cape's tourist flow), Chatham was one of the first spots to attract early explorers. Samuel de Champlain stopped by in 1606 but got into a tussle with the prior occupants over some copper cooking pots; he ended up leaving in a hurry. The first colonist to stick around was William Nickerson of Yarmouth, who befriended a local sachem (tribal leader) and built a house beside his wigwam in 1656. One prospered; the other -- for obvious reasons -- didn't. To this day, listings for Nickersons still occupy a half-page in the Cape Cod phone book.